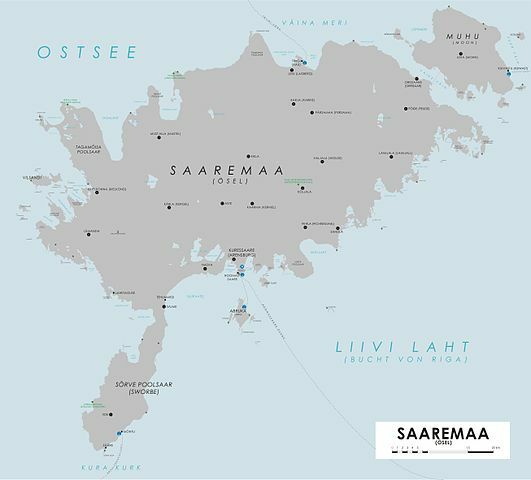 Saaremaa is the largest island in the Estonian Archipelago. 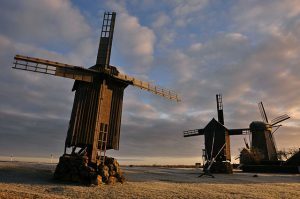 It is connected to the smaller island of Muhu by a 1.5 mile causeway. The islands’ milder climate and strategic location are two of the reasons that these islands have been seized and fought over by so many powers. 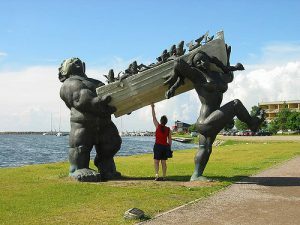 If you have been reading some of the history posts on this website, you will no doubt know that this is common as regards islands. 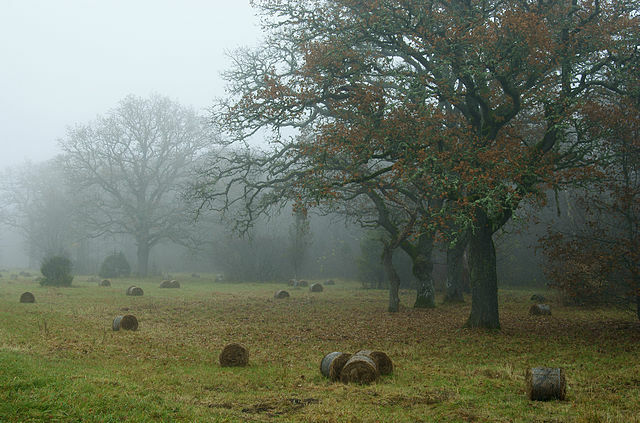 There have been inhabitants on Saaremaa for the last 5,000 years. During those 5,000 years the land has risen considerably, which means that the remains of these ancient coastal settlements were found significantly inland. 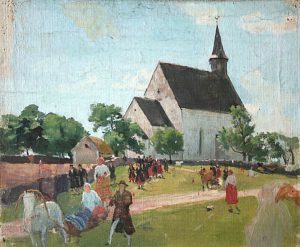 From the 10th to 13th centuries, Saaremaa and Muhu were the wealthiest and most populated part of what is now Estonia. It was around this time that the Danes and Germans, or more accurately, the Teutonic Knights, began to vie for control of the islands. After a failed attempt by the Danes, German rule was established by an army of 20,000 Teutonic Knights in 1227. In spite of frequent rebellions, the Germans held on to the islands until 1559. After that, it was a head spinning succession of different conquerors, which happened in the following order, if I’ve got this figured out right. First the Danes, then Swedes, Danes, Russians, Swedes then Russians. This brings us to the year 1710. The Russians made the islands a part of the province of Livonia, which was governed from the city of Riga in Latvia. 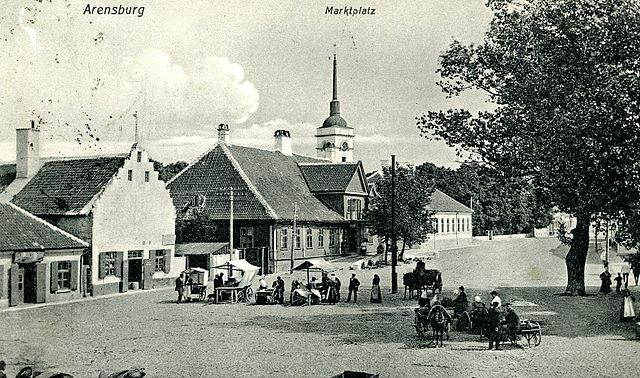 In 1840, the first spa opened in Kuressaare (called Arensburg at the time). It soon became a resort destination for wealthy Russians and Baltic Germans. Today, the island of Saaremaa has more spas than anywhere else in the country. World War I saw the island conquered and occupied again by the Germans. The Germans left in November of 1918 and Estonia was established as a republic. This was to last until 1940. In the summer of that year, all that had been achieved during Estonia’s first republic came to a halt. The Soviet Army occupied Estonia, deporting more than a thousand residents of Saaremaa to Siberia. The German Army arrived in September, landing on Muhu and the islands were under German control for three years. During this time, many more islanders fled or were deported. In 1944 the Soviet Army reached Saaremaa and it became a restricted zone due to its location on the western fringe of the Soviet Union. Travel to or from the islands was nearly impossible for foreigners or even Estonians and several Soviet military bases were established on Saaremaa. During this time, deportations to Siberia continued and nearly a third of the population disappeared, many escaping to Sweden. After the fall of the Soviet Union, Estonia was finally able to establish itself as a sovereign nation again. On August 20, 1991, Estonia was declared an independent republic. The following year, a new constitution was approved and the local currency, the kroon, was implemented. Today, it is astounding the progress that Estonia as a country has made in its transition to a sovereign nation, and fortunately, the islands of Saaremaa and Muhu bear few scars from the occupation other than some ruined Soviet military installations. 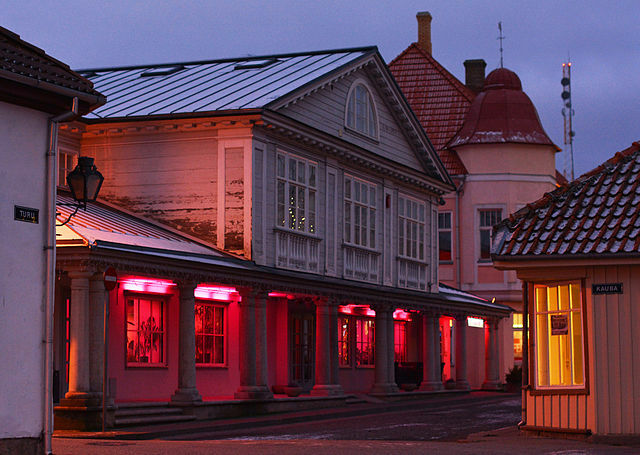 Kuressaare, with a population of about 15,000 people is the main city on Saaremaa. A must see is the medieval 13th century castle. This huge edifice stands on an artificial island, ringed with a moat, topped with four towers and surrounded by a park. The best preserved castle of the Baltic region, its chambers, staircases, passageways and great halls do not disappoint anyone’s expectations of a Gothic fortress. There is even a room with no floor where prisoners supposedly were thrown to hungry lions. The Regional Museum is located at the castle and the park contains some historic wooden buildings and a Citizen’s Museum. The Kaali meteorite crater has a diameter of 360 feet and a depth of 72 feet. Located on the northern part of the island, it is actually the largest of 9 and is filled with water. There is much debate about how old it is with estimates placing the event at anywhere from 2,000 to 7,600 years ago. The impact of the meteorite is thought to have been the equivalent of the Hiroshima bomb and the surrounding forest was burnt as far as 3.7 miles outwards from the center of the impact. The site was sacred to the early inhabitants, whose legends say that the sun came to be buried there. The Angla windmill hill is a group of 5 windmills of which 4 are in the old wooden style that used to dot the landscape of the island. The largest and newest is a Dutch style windmill. All of the windmills are open to explore. Also located here is the Angla Heritage Culture Centre, where one can participate in numerous workshops including pottery, felting and bread making. The Sõrve peninsula is another great area to explore. While the cliffs of the peninsula’s coastline provide great views, there is also a lot of history to explore, including an old Soviet military base that can be toured. A graveyard and a monument give testament to some of the heaviest fighting of World War II during a night battle in October, 1944 between the Germans and the Estonian-Russian troops. There is a lighthouse at the tip of the peninsula. 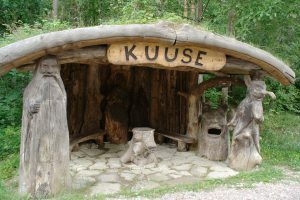 Inland from the peninsula and west of Kuressaare is the Viidumäe Nature Reserve. This protected area contains a wide variety of rare and indigenous plants. It is also the location of the highest point on the island. There is an observation tower there that offers spectacular views, especially at sunset. Vilsandi National Park to the west of Saaremaa is located on a group of islands and islets, the largest of which is Vilsandi. Here among juniper and currant bushes, you will find a working ostrich farm. It is also a bird reserve and hiking through the shallow waters to the island of Vilsandi is a very popular activity with Estonians as well as foreign tourists. 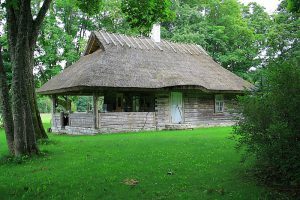 Although sometimes referred to as the ‘doormat’ of Saaremaa, Muhu offers plenty to the visitor who stays. In fact, Pädaste Manor is one of the most luxurious hotels in the country and attached to it is Alexander, a many time best Estonian restaurant winner. The manor has a history dating back to the 16th century. The beautiful setting, outstanding food, orchards and seaside paths make it one of the most relaxing places I have had the good fortune to visit and I highly recommend it. The manor itself is beautiful and the beautifully appointed rooms offer private balconies and a high level of privacy. Spa treatments, a private cinema and Nordic Island cuisine are all part of the numerous offerings you will find here. The island is well known for it’s intricate folk costumes and Koguva Village, on the western end of the island, is the best preserved 19th century village in Estonia. This fishing village is a protected ‘open air’ museum, whose houses date as far back as the mid 18th century. Spending time here will make you feel as if you have traveled 100 years into the past. There are several small old churches, working windmills, some scenic cliffs along the shore and yet another working ostrich farm. 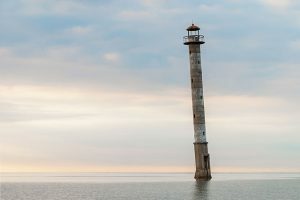 Connected to Saaremaa by a causeway, Muhu is accessible from the mainland via one of Estonia’s seven ice roads in the winter, and by ferry during the summer.